It is now known as Kiss Tel Aviv (Little Tel Aviv), as a large Jewish community is gradually moving back into the rather upmarket district, recreating the pre-war environment - a cultural, educated community of politicians, writers, actors and the small traders and menders who give it an unmistakable atmosphere. Shops along the acacia-lined street offer flowers, jewels, fur coats and beauty products, blending in with the old style shoe repairers, zip menders and dingy borozós (wine bars). There is an abundance of hostelries with terraces on the pavements, squeezed in between parked cars. Shop-keepers all stand on their doorsteps, gazing out at the traffic and greeting passers-by by name. “Csók életem,” (Kisses, my life) says furrier Ica Nagy, with time on her hands, since the fur trade is stagnant in the heat of summer. Her red neon Szûcs sign has beamed out from No. 13 for 45 years. She has seen many changes in her 65 years of living in Pozsonyi út, which she says had a tram running along it and cobblestones, and must have resembled a thinner version of today's Bartók Béla út in Buda, until 1958. In 1956, the peaceful scene was rudely interrupted in the autumn by Russian tanks. Nagy stayed in the street throughout the revolution and witnessed much fighting from her doorway. There are bullet marks on the walls above the shop and Nagy says, "I was even shot at when I hurried across the road to a café opposite to buy biscuits." István Nagy opened his furriers (szûcs) in 1932, when many of the buildings were newly built. He died twenty years ago, but his seventy-year-old wife has continued the fur business on these premises with her son helping. She says life was better in the old days, "The old style of rich people were very different from the new style rich." She says the area was typified by gentle folk, actors and politicians. Now she lives in fear of burglars, as robbers are working their way down the street. 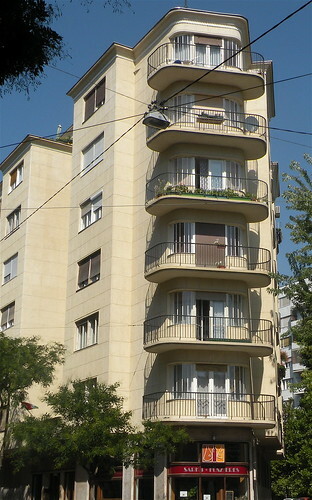 Much of Pozsonyi út's elegant buildings were erected in the thirties, and the style is inimitably square, solid, with the flats' interiors cavernous and spacious. Real estate prices in the area are soaring and the only reason Ica Nagy is not squeezed out is because she now owns the premises. Another couple feeling the pinch are János and Éva Víg who have run the Víg-Vino Borkimérés at No. 5 (wine off-licence and specialty wine shop) for five years. Before that, they sold spare parts, but like many of the small businesses which open and close every day on Pozsonyi út, they tried something different. It seems to be going well, on a Monday afternoon business is brisk, as customers pass under a beautiful claret and gold sign, which recalls past trading outlets. The sign, Éva says is "Bordeaux for the wine and gold because gold comes from wine." János says he has over 300 hundred wines from all over Hungary, the best region he says is Villányi. "There is no better wine in the world than Hungarian," he says proudly. Éva is not so enthusiastic, "If I could do it all over again, I would not open a shop here," she says, "People open businesses on this street every day because they think there's money in it, but we don't get so many customers passing through here and many close down soon. Only old people live here." Besides specialist wines from private vineyards, they also measure out cheaper wine for pensioners who bring along recyclable bottles. "This used to be a very high class area in the past, but it's gone downhill lately," sighs Éva. A sign engraved in stone above the door reveals that Ginczler Herman designed the building in 1939. Pozsonyi út has a coffee pot mender, a watch mender, shoe mender, scores of bars and restaurants, you could live your whole life here and never have to leave. Ágnes Asbóth, out walking her fox terrier, Samu has lived here all her 37 years, and has no desire to leave. She continues the literary traditions by proof-reading novels from her flat overlooking the park. A walk down Pozsonyi út continually reminds us of the rich literary heritage, starting at Jászai Mari tér, named after great Hungarian tragedy actress, Mari Jászai, who played many Shakespearean roles in the now demolished National Theatre. The street then crosses over Katona József utca, a plaque describes how he wrote Bank Ban. Radnóti Miklós utca commemorates one of Hungary's best loved poets, a Jewish writer who died on his way back from a Hungarian labor camp. Some of his most moving poetry was found sewn into the lining of his jacket. Not only Hungarian authors are credited. French writers Balzac and Viktor Hugo are also remembered in streets, as is Russian writer Nikolai Gogol. Pozsonyi út begins in earnest after the Budai Nagy Antal utca where the two trolleys 76 & 79 have their termini, although in reality the route merely continues in a ring cycle all day long, leading along a back route over the Nyugati railway line to Baross tér and Keleti station. On the corner at No. 3 is the Szamovár presszó (cafe), redecorated recently, and changed from the tradition brown presszó style into a hideous shade of kingfisher blue. On the pavement outside is a little flower stall, one of the many flower vendors of Pozsonyi út, which while enjoying its fair share of busy traffic, can also claim to be one of Budapest's most green streets. A little further on, the Piccolo Sörbár (beer bar) has a little terrace outside, where you can enjoy a cool korsó (half-litre mug) on plastic garden chairs under the trees. Many squeeze into its tiny premises, which still retains its sixties decor. If you walked the length of Pozsonyi út and sunk a korsó at each of the many watering holes, you'd certainly not be able to walk straight back. Over the road at No 4 is the Kandinszky bar. Inyenc ('taste treat') at No. 7 offers specialty teas and coffees and things in mayonnaise to take away. Virágért ('For Flowers') recalls the socialist days when shops simply stated what you could buy - if it was in stock -virágért (for flowers), bútorért (for furniture), közért (for general goods). Opposite at No. 10 is Villért (for lighting), still displaying the old, much the worse for wear, neon sign, where ‘lighting technology’ can be bought. To illustrate Mrs Víg's statements, we next pass some empty show fronts, gathering dust, while opposite, a new, very chi-chi jeweller’s Grén offers special gold jewelry for graduation ceremonies. Over the road at No. 10, the Kiskakkuk étterem (Little cuckoo restaurant) a famous old style Hungarian restaurant appears to be also in a state of transition and dust gathers in the windows. Further along, István Gödör and György Takács run a hairdresser, where, to my horror, they once managed to tease my very short hair into a towering sixties beehive, which, no doubt took a certain skill and whimsy. We are now on the corner of Raoul Wallenberg utca where an elaborate and tasteful plaque and bust conglomeration commemorates the Swedish diplomat whose heroic acts saved thousands of Jewish people from the gas chambers. Many of the houses on the street, for example No. 14, were used as 'safe houses' under diplomatic protection for Jewish to hide in during WWII. A TV Shop showroom sits next to Novaglobus, which is worth visiting to see its window display of sinister equipment and spare parts. One can barely imagine what the plastic tubing and oddly-shaped creations are used for. Over the road, the Pozsonyi Kisvendéglô offers a good list of soups and meaty dishes. On the corner with Radnóti Miklós utca is a little patch of green in front of the Herman Ottó primary school. A statue of a young girl in white marble sits outside the red brick school building. Opposite at Number 26, a very beautiful building with elegant balustrades and wrought iron work sits among the rather square thirties' blocks. The Ipoly Café, named after a river that rises in Slovakia, at Pozsonyi út 28 always has a crowd of shifty-looking men in sunglasses, sitting outside on the pavement enjoying Segafredo coffee and gossip, while their radio phones lie dormant, lined up on the metal tables. At Pozsonyi út 31 we are approximately half way along the street, at the corner of Gergely Gyôzô utca. There is a strong wine smell from the mulberry tree and its overripe fruit lying crushed on the concrete pavement. On the corner with Balzac utca, the Cipôjávító szalon (shoe mender's salon) is an excellent shoe repairer which also mends shoes, cuts keys, un-snags zips, lifts skirts and reattaches all manner of attachments. Opposite is a beautiful old fashioned borozó sign featuring a bunch of grapes of the Móri borozó. The sign says the wine comes from grapes produced on a state farm. Inside, little square tables are covered with green checked tablecloths in a very atmospheric modest bar. The traffic whizzes past in both directions and you have to pick your way gingerly through the cars parked all over the pavements too. On Herzen utca, a beautiful building, designed by Hugo Gregersen in 1937, is decorated by a woman's face in stone watching over the door in the company of lions and griffins. Crossing over Herzen utca, the Bébi Cukrászda (Baby Patisserie) has the traditional neon sign and some wonderful cakes and dolls made from icing in the window. Szent István Park looks like a building site these days, which is basically what it has become. Hundreds of workmen bustle around, driving buzzing dumper trucks or shovelling earth mounds. While restoration work trundles on, sad residents dolefully walk their dogs. Bereft of the once beautiful walking area, they wander over mounds of earth and rolls of wire. Sándor Fegyverneky, chief builder for the XIII local government says the original style of the spacious, bushy park will not be changed. "The park will keep the original style, the pool, paths and bushes will all be renovated and replanted and it should be completed on September 1st." Fortunately, he says, the two empty temple stone buildings will not be removed. "The atmosphere of a park comes not only from its vegetation but from the buildings, so nothing will be taken away," says Fegyverneky. Around the corner of the park, at Újpesti rakpart, a modest doorway leads to the ex-residence of ex-Prime Minister Gyula Horn. Just after he became PM, a dubious looking caravan tried to blend in with the bushy scenery in Szent István Park, and burly chaps in sunglasses sat all day watching something, while cables and wires lead to the apartment block. On the left hand side overlooking the park, is a beautiful thirties block in white marble with arched doorways at Pozsonyi út 38. The Dunapark café used to be on the ground floor. Its modern, split-level interior is still visible through giant windows. 2010 Update: The Dunapark cafe has since reopened and its elegant Art Deco interior has been tastefully restored to its former glory. The cafe is very popular, especially in summer, when the tables and chairs spills out onto the pavement and almost into the bushes of neighbouring Szent István Park, also now renovated and restored (www.dunapark-kavehaz.hu). At the junction with Viktor Hugo utca and Wahrmann Mór an amazing triangular shaped building with six sunny yellow balconies (see main photo at the top) looks like it must have been where they filmed the advertisement for Crepto toilet paper - the scene when each resident comes out onto the balcony and simultaneously cuts a slice of toilet paper. However, in the Cosmax beauty salon underneath, receptionist Ilona Csányi says its not the building featured, "Although many people come in and ask whether it is," she says, adding that she thinks the area is still very high class, judging from the clientele of actresses and politicians' wives who come in for expensive treatments. It's worth peeping in the hall of this building, a little further along the street, as it has a famous Art Deco hallway and staircase. At Pozsonyi út 53 is the most beautiful doorway in the street. Peasant scenes are carved in stone above the door and the window frames are old brown wood offset by the dark green leaves of succulent pot plants in the lobby. Inside a rounded staircase leads up from an elegant hallway, lined with brown marble columns. It is the home of Mozsolits and Associates legal offices. A smell of lecsó (Hungarian-style ratatouille) cooking pervades the heavy summer atmosphere, the paprika aroma is unmistakable. This is very much a lived-in street, despite all the offices and shops. The Cheers sörözô at Pozsonyi út 52 is dusty and empty - it probably couldn't compete with the Tiszakecske Solohov borozó at No 48 where a korsó of draught beer costs only Ft95. On the left side of the road is the very blue, modern ÁPV Rt building, which looks out across the river to Margit Sziget. Next to the material is the spiritual. The Pozsonyi út Reform church, where Bible classes, Sunday school and services all take place in the modern building, which looks marginally better from the river side. A separate Bauhaus-style tower recalls those in Pasaréti tér and Csaba utca. Pozsonyi út started with a computer equipment shop and now ends with ABN Amro bank headquarters, within the high-tech commercial bookends lies a wealth of literary history. I really like your articles on Budapest. My name is Roberta Gyori and I have been working in the travel industry for several years promoting Hungary as a destination. I’ve recently started my own website called visitbudapest.travel. If you have some time please take a look at the site (http://visitbudapest.travel/) and if you like it perhaps we could exchange links. My aim is to introduce Budapest through a ‘local’ perspective.